Since its inception, the Konza Prairie LTER program has built upon a long-term database on ecological patterns and processes derived from a replicated watershed-level experimental design, in place since 1977. This design includes replicate watersheds subject to different fire and grazing treatments, as well as a number of long-term plot-level experiments. This multi-scale, long-term approach has led to numerous important discoveries about how fire and grazing interact to affect the ecological dynamics of grassland communities at scales ranging from patches to landscapes, with relevance to grasslands globally. The effects of climate are addressed by long-term studies that encompass the natural climatic variability, and possible directional changes, characteristic of this region, as well as manipulations of water availability in field experiments. Within selected “core” LTER watersheds, permanent sampling transects are replicated at various topographic positions (n=4/topographic position/watershed), where ANPP, plant species composition, plant and consumer populations, soil properties, and key above- and belowground processes are measured. The collection of diverse data from common sampling locations facilitates integration among our research groups. 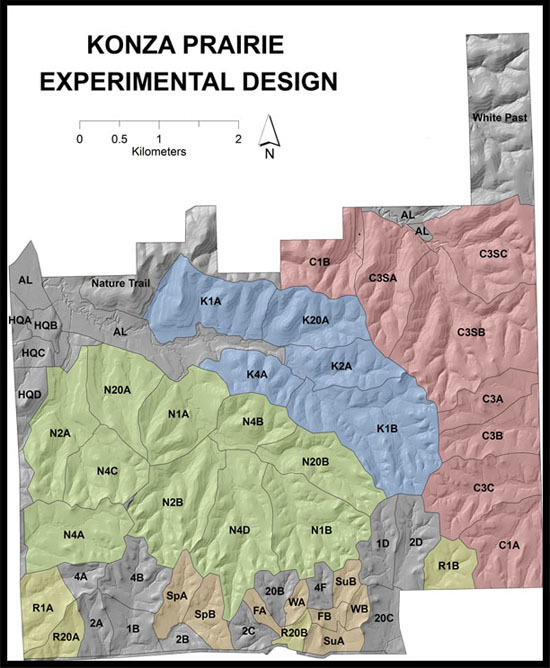 In total, the Konza LTER Program incorporates explicit study of the major factors influencing mesic grasslands in a long-term experimental setting. It has the essential components of a statistically rigorous ecological research program designed to elucidate patterns and processes inherently important in grasslands, and address the potential impacts of global change in these ecosystems. Below we elaborate on our rationale for focusing on fire, grazing and climate, and provide a brief overview of the site-based, watershed-level experimental approach, along with a list of selected long-term, plot-level experiments. Konza Prairie site experimental design, and watershed-level fire and grazing treatments. Watersheds open to bison grazing (‘N’) are highlighted in green, and cattle-grazed watersheds (‘C’) are highlighted in red. All other watersheds are ungrazed. 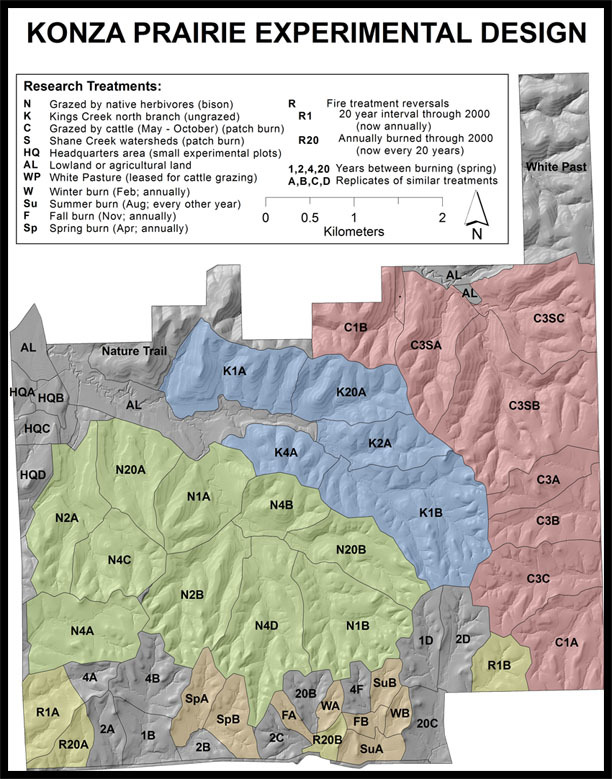 Numbers in watershed codes designate fire return intervals for spring-burned watersheds, and the last letter of watershed codes (A,B,C,D) is used to identify replicate watersheds of the same treatment. Most prescribed burning is conducted in the spring (late-March through April). Watersheds subject to different seasons of burning are highlighted in light green, and the Fire Treatment Reversal (‘R’) watersheds are highlighted yellow. The Kings Creek drainage basin, the location of many LTER stream studies and a USGS benchmark stream gauging station, is highlighted in blue. Many of our plot-level experiments (Belowground Experimental Plots, RaMPs, Irrigation Transects) are located at the headquarters area (HQ) in the northwest portion of the site. A brief description of selected long-term, plot-level experiments of the Konza LTER program. Such experiments complement our long-term watershed-scale studies, and provide important information about mechanisms underlying responses at broader scales. These experiments also act as focal points for ecological studies that span multiple disciplines. Fire is essential in mesic grasslands worldwide, and human alteration of fire frequency is a key element of global change in these grasslands. Fire was important historically in tallgrass prairie, and is now managed by humans to limit the growth of woody plants and to promote the cover and productivity of C4 grasses. Fire alters the structure and function of grasslands, and our studies of the ecological consequences of fire have spanned multiple spatial and temporal scales and levels of ecological study. This hierarchical approach has identified many of the mechanisms contributing to responses at higher levels. For example, fire changes the light and soil environment of emerging plants, altering phenology and physiological responses, increasing ANPP, increasing competition for light and N. These changes contribute to reduced abundance and richness of C3 plants and a concomitant decline in biodiversity. Changes in vegetation structure, composition and tissue quality also elicit responses in aboveground consumers and affect belowground invertebrates, mycorrhizae and soil microbes. The experimental design at Konza includes replicate watersheds (avg. size = 60 ha) that have been burned annually or at 2-, 4- and 20-year frequencies, encompassing a range of likely natural fire frequencies and management extremes. Most watersheds are burned at the end of the dormant season (April), when the greatest frequency of lightning and prescribed burning occurs regionally. However, fires historically occurred at other times, and during LTER IV we initiated a “season of fire” experiment, with replicate watersheds burned in the spring, summer, fall or winter. To address trajectories following a change in fire regime and the role of fire history (legacy effects), we began (in 2001) a long-term “fire treatment reversal” experiment (annual and 20 yr fire treatments switched on replicate watersheds). This experiment is providing insights into the temporal scales over which plant and soil processes respond to changing fire regimes, and the role of site history in affecting responses to fire. We also incorporate fire into smaller plot-scale plot experiments on Konza, where mechanisms underlying effects of fire are more readily addressed. Grazing, like fire, was historically important in tallgrass prairie, but is now largely under human control, with grazing by cattle the dominant land use in the Flint Hills. In fact, changes associated with the management of megaherbivores are among the most significant in the recent history of mesic grasslands worldwide. Understanding the role of grazers in these grasslands is crucial. To address the role of native grazers and important fire - grazing interactions, bison were reintroduced in 1987 to a 1000-ha area of Konza that includes replicate watersheds burned at 1-, 2-, 4- and 20-year intervals and a range of topography and vegetation types. Comparative studies of native (bison) vs. introduced (cattle) ungulates are also being done to understand the impacts of changing land use in North American grasslands. Functional similarities and differences in the effects of bison and cattle on grasslands are being assessed by long-term comparisons of bison and cattle grazing at both the watershed and small pasture (5 ha) scales. A new initiative for LTER VI includes an assessment of patch-burn grazing as an alternative to uniform season-long grazing, which may increase landscape-scale heterogeneity and enhance conservation of grassland species in areas managed for cattle grazing. Climate is also a critical driver of grassland composition and functioning. North American grasslands were formed by climate changes originating during the Miocene-Pliocene transition, and their present day distributions depend on regional temperature and precipitation gradients. Although our emphasis on fire and grazing interactions is clearly appropriate, and unique within the LTER network, >30 years of study has underscored the pervasive role of interannual climatic variability in this ecosystem. For mesic grasslands, the mean and extremes of precipitation (e.g., floods and droughts) affect most ecosystem processes. On a continental scale, variability in precipitation affects productivity more in grasslands than in other North American biomes. Thus, responses to altered temperature and precipitation regimes will be an important component of global change in these ecosystems. Climate change predictions for the Central Plains include increased temperatures and increased temporal variability in rainfall (i.e., larger storm events and longer intervening dry periods. Changes in temporal patterns of precipitation are predicted impact grasslands more than changes in precipitation quantity alone. Our research is addressing to the role of natural climatic variability on a broad range of ecological processes and interactions, as well as the impacts of more extreme rainfall patterns and extreme droughts on grassland communities and ecosystems. Building on the unique site-based experimental design of KPBS and a legacy of long-term experiments, our current core LTER research is organized around the following themes, chosen to foster integration across disciplines, biological levels of organization, and temporal and spatial scales of study: (1) Land-use and land-cover change, including (a) impacts of changing fire-grazing regimes (b) causes/consequences of woody plant expansion, and (c) ecosystem restoration; (2) Ecological responses to climatic variability and climate change; (3) Responses to altered biogeochemical cycles in terrestrial grassland ecosystems; (4) Aquatic ecology and effects of altered water quality and hydrology; and (5) Regionalization, remote sensing, and modeling. Konza LTER activities within these research themes are coordinated within and across research groups, and include projects and datasets encompassing the original five LTER “core areas” as well as specific research foci outlined in this proposal. Many linkages exist among these research groups and their goals, and our short-term and plot-level experiments are integrated with core LTER experiments and long-term data enabling numerous opportunities for synthesis. For more detailed information on our current research objectives please view our current LTER proposal.